Thanks to MCHIP training, Dr. Barry, with midwives at the Regional Hospital of Faranah, helped save the life of a new mother. Here he views the maternity department’s partograph chart. Conakry, Guinea—When Dr. Mamadou Oury Barry first saw Hawa Condé, the 23-year-old patient was crying out, “I’m going to die.” The young mother had reason to fear. She had given birth 24 hours earlier at her home in the village of Tiro, and though the labor and delivery of her baby boy had gone smoothly, the placenta had not been delivered. Hawa understood well the importance of expelling the placenta—after all, it was her third delivery. Accompanied by a relative, Hawa had walked to the local health center in Tiro, where she was told to go immediately to Faranah for treatment. It took some time to arrange for a car for the 20-minute drive. 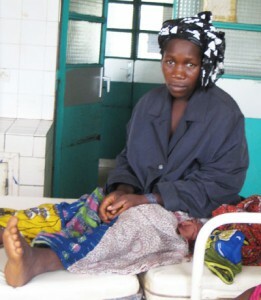 Hawa Conde, in the maternity ward, after Dr. Barry helped prevent her from bleeding to death. Once Hawa arrived at the hospital, the staff took swift action. Midwives brought Hawa into the delivery room and gave her an injection of oxytocin to help the uterus contract to deliver the placenta, but they were unable to deliver it. They then called in Dr. Barry to help. Thanks to training that Dr. Barry and other staff had received in emergency obstetric and newborn care (EmONC) through a Jhpiego-supported effort to improve services at the hospital, he was able to take immediate action on this day in July 2012. This training took place at the request of the Ministry of Health and through the U.S. Agency for International Development’s (USAID’s) flagship Maternal and Child Health Integrated Program (MCHIP). In Hawa’s case, Dr. Barry quickly assessed her condition. He found that she had very low blood pressure, an accelerated pulse, rapid breathing, a very pale complexion and a hanging umbilical cord. After closely following the prescribed EmONC steps, including appropriate infection prevention measures, the doctor and two midwives worked together to manually remove the placenta and then properly disposed of it. hours… ,” said Dr. Barry, a father of four children whose wife is a nurse at a local health center. The hospital in Faranah is among 38 health facilities in Guinea that have benefited from other efforts led by Jhpiego and partners to strengthen health care delivery in four regions of Guinea using a Jhpiego-pioneered quality improvement approach. 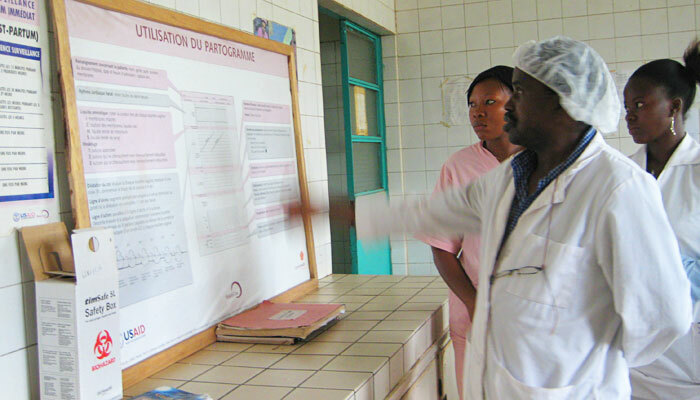 Jhpiego introduced Standards-Based Management and Recognition (SBM-R®) in 2009 at six health facilities. This practical, systems-strengthening approach provides health workers and facilities with tools and methods to improve performance and quality of services. The focus was on building the capacity of health care providers in family planning and infection prevention, as well as fortifying their skills in EmONC. Before SBM-R was introduced at the regional hospital in 2010, the facility faced challenges related to poor infection prevention practices; incorrect disposal of medical waste; lack of a water source on site (staff fetched water from the river); lack of training for new providers on management of obstetric emergencies; and occasional stock-outs of contraceptive methods. Through SBM-R, the hospital staff have addressed many challenges and achieved successful results in key performance target areas. The most notable increase was in family planning, which went from 61 percent of performance standards achieved at the initial assessment to 91 percent achieved in April 2012. The results for EmONC were also impressive—increasing from 52 percent to 80 percent for the same time period. 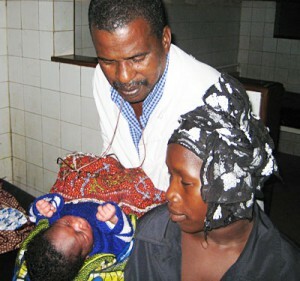 Dr. Mamadou Oury Barry with his patient, Hawa Conde, and her new baby. The hospital now has an on-site water pump, improved infection prevention practices, increased numbers of clients using delivery and family planning services, and expanded staff training opportunities. During a visit to the hospital, the Minister of Health, Dr. Naman Keita, congratulated the staff on the facility’s cleanliness. Hawa may not be aware of the work to strengthen health care services for women and their families, but she is grateful for the care she received. Sitting up in bed later that day, the exhausted mother calmly held her newborn son and tried to nurse him while he squirmed.